During the first days of January, there were strong indications that the NVA were massing four divisions to attack the US Marine base at Khe Sanh. The enemy attack commenced on 21 January and this 66-day siege of the Khe Sanh Base was widely considered as a major showdown between NVA and US forces. As a consequence of this enemy threat to Khe Sanh, the 1st Cavalry Division was given the mission to plan for the relief or reinforcement of the Khe Sanh Base. In preparation for this contingency, the 1st Brigade deployed north to Hue-Phu Bai on 17 January, leaving our battalion at Bong Son with the mission of turning over the responsibility of the brigade area of operations to units of the 23rd “Americal” Division. It had already been decided that our Battalion Commander, LTC Stannard, would be promoted to Colonel and replace Colonel Ratten as Commander of 1st Brigade in February. The battle of Khe Sanh began on 21 January with massive enemy artillery barrages that destroyed most of the Marine ammunition stocks and fuel supplies. In response to the NVA attack on Khe Sanh, the 1st Brigade deployed to Quang Tri and established firebases to the south and west of the town on 25 January. On the political front, the North Vietnamese had announced in October 1967 that they would observe a seven-day cease-fire during the Tet holidays. Tet is the Vietnamese New Year celebrated during the latter part of January with a three-day festival. The South Vietnamese also decided to observe this seven-day truce. January passed quickly for the members of Bravo Company. The Tet cease-fire was effective on 29 January. 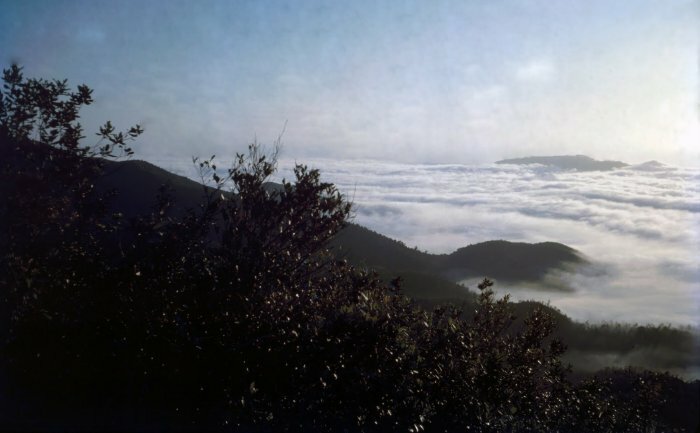 On or about 28 January, we combat assaulted onto a hilltop overlooking the Bong Son plain and LZ English, and received detailed instructions on the scope of the cease-fire, the pertinent rules of engagement during the Tet truce and assigned the mission of providing early warning of any enemy troop movements, with special attention to the security of LZ English. A relaxed holiday atmosphere prevailed on our hilltop during daylight hours as some troopers read paperback books, others played cards, there was even a few miniature chess sets in use, and many gathered in small groups to chat about this and that. It was business as usual at night and we followed all of our standard procedures for night defense. However, while we were enjoying a relaxing time on our hilltop, enemy forces were very active violating the provisions of the Tet cease fire by deploying their units in preparation for attacking major towns and military installations throughout Vietnam. These enemy attacks started with attacks on Quang Tri and Hue on 31 January. Twenty-four hours later, the NVA and VC conducted simultaneous attacks on over 100 towns and cities. These were surprise attacks and allied forces were not prepared. As a matter of fact and taking advantage of the conditions of the truce, most of the ARVN soldiers had received a special seven-day leave so that they could celebrate the Tet holidays with their families. Although the Tet offensive was country-wide, there was no major enemy action in the Bong Son area and our special airmobile capabilities were urgently required up north where enemy forces had taken control of the cities of Quang Tri and Hue, and a large NVA force of 12,000 soldiers had completely surrounded the US Marine base at Khe Sanh. We would deploy north for this mission, but this time we would not return to our homestead on the Bong Son plain. At the start of the Tet Offensive, the 1st Brigade was committed to the operations against enemy forces in Quang Tri, while the 3rd Brigade had a similar mission for the ancient capital city of Hue. Units of the 23rd Division relieved us and Bravo Company moved to the airstrip at LZ English and waited several hours for the C-130 Hercules aircraft that would take us to Quang Tri. The whole company was loaded into one C-130 and we took off on a sixty-minute flight to Quang Tri. As we approached the Quang Tri area, our “nervous” Air Force pilot stated that he had problems with his instruments and could not land at Quang Tri. So we returned to LZ English and waited around for a replacement aircraft. Off again and this time we landed at Quang Tri and were met on the airstrip by our Battalion Commander, LTC Stannard. After a briefing on the enemy situation and our new mission, we loaded helicopters and combat assaulted in an area northeast of Quang Tri, close to the border between North and South Vietnam. Quang Tri City is the provincial capital for the northernmost province of South Vietnam and is located about 10 kilometers inland from the Gulf of Tonkin and 25 kilometers south of the demilitarized zone. 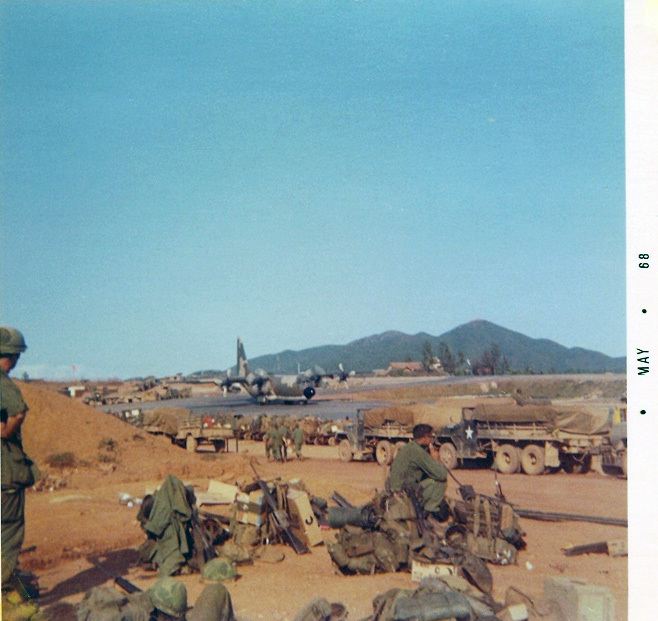 The mission of enemy forces in Quang Tri was to seize control of the city, however, they appeared to be inexperienced and unfamiliar with the airmobile tactics of the 1st Brigade. As a result of numerous air assaults by the cavalry, these enemy forces were caught between units of the 1st Brigade and ARVN forces and were quickly rendered ineffective. During the evening of 31 January, the enemy commander decided to abort the attack on Quang Tri and enemy forces started to withdraw in small groups. Quang Tri City was cleared of the enemy by midday on 1 February and the 1st Brigade pursued the retreating enemy forces. The enemy suffered high losses with 914 killed in action and 86 captured. As mentioned earlier, we received only one map for the whole company from LTC Stannard at the Quang Tri airstrip. This critical shortage of maps turned out to be a general shortage of many supplies that continued for several months due to other priorities dictated by the Tet Offensive. We had plenty of food, water and ammunition, but we had problems obtaining poncho blankets and many other creature comforts. In other words, it was easy to recognize that the Tet Offensive had brought about significant changes and many of our former luxuries from the Bong Son era simply disappeared, ranging from immediate replacements of poncho liners to surprising the troops in the field with a delivery of ice cream by helicopter. We also noticed that mail delivery tended to be sporadic, that there was much more use of army canned food products, like powdered eggs, and it was often very difficult to obtain coke or beer when we secured a firebase. Needless to say, we were soon back in business scrounging for our super deluxe barbecues. Another major change was our enemy in the I Corps Tactical Zone. We rarely had contact with the Vietcong, but very frequent contact with NVA units and usually in the form of surprise meeting engagements. We were very close to the Demilitarized Zone (DMZ) and that meant that the NVA units did not have long supply lines for replacements or supplies coming down the Ho Chi Minh Trail. In fact, they had plenty of ammunition, to include mortars and 122 Rockets, and they certainly used them on us. The enemy would fire 122 rockets at our night defense positions and on one occasion, they even used mortars. For similar reasons, they were also more aggressive in their tactics. During a single day operating in the jungle west of Quang Tri, enemy engagements included contact on one flank, a little later we had contact in the rear, and then in the afternoon we had contact on the other flank. After such a hectic day, we usually initiated a mad-minute firing of individual weapons at first light the following morning. In early February, our Battalion Commander, LTC John Stannard, was promoted to Colonel and replaced Colonel Donald “Snapper” Rattan, as Commander of the 1st Brigade. Our new Battalion Commander was LTC Howard Petty and our battalion was now collocated with the 1st Brigade at a newly established base called LZ Betty, located to the west of Quang Tri. The siege of Khe Sanh continued unabated and 1st Brigade started to stretch their operations west from Quang Tri toward Khe Sanh. On one such operation in early March, Bravo Company conducted an air assault into a LZ that turned out to be not only hot, but also outside of the range of friendly artillery. We had several wounded troopers and we managed to break contact and evacuate them. During the night of 15 March, the enemy attacked LZ Betty with mortars and rockets. A mortar round landed on the tent occupied by our Battalion Commander, LTC Howard Petty, and our Battalion Operations Officer, Major Barney Darby. LTC Petty was killed immediately and Major Darby was evacuated with serious wounds. LTC John V. Gibney assumed command of our battalion on 16 March. The immediate loss of both the commander and operations officer left a vacuum at the Battalion Tactical Operations Center and, therefore, Captain Peter O’Sullivan was reassigned to the Battalion Staff to provide some continuity. Captain Gregory Tillitt replaced Captain O’Sullivan as Commanding Officer of Bravo Company on 26 March.